The number one must-have tool for operation and care of your oven. Soft brass bristles gently brush away ash and hot coals from the hearth. Used for general fire management. 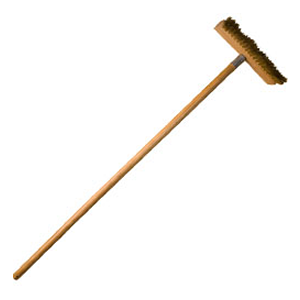 The Wildwood pizza oven brush sports a 42″ long handle and brush head with a scraper, this is a great oven management tool. We use this to push the fire and hot coals to different locations in the ovens, and for general ash relocation. The importance of this tool can not go unrecognized. A staple in all of our pizza oven kits for a simple reason. It works! Made in America, this tool offers great performance and value.